Hello fellow nanoKeyer builders, if you experience after the first Firmware upload that the nanoKeyer is working, but the speed potentiometer is not responding, this may be caused by a wrong default state of the potentiometer mode in the firmware. Enter command mode by pressing the command button (left button) and you will hear a “boop beep”, after which you can enter various commands by sending character using the paddle. Now key with your paddles a letter V.
To exit command mode, send X in CW using the paddles or just press the command button again upon which you will hear “beep boop” and you’ll be back in regular sending mode. Now your WPM speedpot should be working again. This mode change will be stored into internal EEPROM and will be persistent also after next power up. It has taken a bit longer than I expected but finally a larger batch of nanoKeyer parts and REV. C PCB’s has been completed and can be ordered again. I finished to prepare this batch of prepacked parts and PCB’s over the last weekend and activating the PayPal button on the GET ONE page was slightly delayed due to a short notice business trip early this week. You may now finally “get one”…. Finally some more missing PCB’s arrived this week from the overseas manufacturer. I spend some time today to pre-pack some of the parts and PCB’s (REV C version) for the “Parts Sourcing Service”offered on this side. This is how my packing table was looking during the packing excercise. 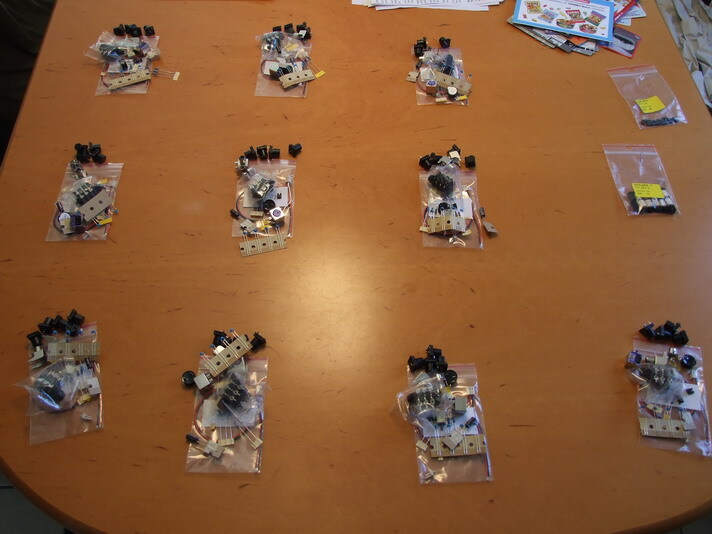 The parts are packed in batches of 10 pieces in parallel…. Fits my table nicely as you can witness below…. Stay tuned. I shall be able to activate the PayPal button on the “Get One” page within next 2-3 days once I have set-up the stock tracking function that PayPal provides in order to avoid overselling. People this way will get a notification message during the order process if parts are sold out and the order process will be automatically aborted.